ONLY RM25. Yes, that’s all you pay for a meal at Sunway Putra Hotel’s Coffee House. There are eight items on this special a la carte menu which includes dessert, freshly brewed coffee (black, latte, cappuccino) or tea. Love the Spaghetti Aglio Olio With Prawns. Wish there is more spaghetti though. The pasta is topped with rocket leaves and a slice of toasted garlic bread. So yummy, with just the right amount of chilli flakes and the prawns are fresh and crunchy. There are plenty of noodles choices. Who doesn’t love Mee Mamak? The noodles, with chicken, potato, fish cake, cabbage, beansprouts, chopped tomato, mustard leaves and egg, are fried with chilli paste and served with fried egg, lime, sliced cucumber, sliced tomato and salad greens. I’m not that keen on the Penang Char Kway Teow though as the chef does not use chilli paste in the frying. Somehow, sliced fresh chilli does not give the same effect in taste. The Cantonese-style noodles is what is otherwise known as wat-tan hor. The kway teow comes with a thick egg sauce and you’ll find carrot, mustard leaf, shitake mushroom, broccoli and cauliflower. The jewel in the crown is half of a slipper lobster that’s so sweet and juicy. I pushed all the shitake mushroom to the side though. Still wondering why the chef has soaked the mushroom in sugar syrup. Hmmmm…. But otherwise, it’s comfort food. Like rice? The signature rice dish is the award-winning Nasi Lemak Gunung Berapi. The rice is shaped like a mountain and the sambal drizzled to appear flowing down the sides, like lava from a fiery volcano. On the side are fried groundnuts, acar, ikan bilis, cucumber, salad and hard boiled egg as well as two prawns keeping cosy in a bowl of sambal and a deboned chicken thigh, marinated with fragrant spices and deepfried. For Hainanese Chicken Rice, there is a choice of poached or roasted chicken. The deboned chicken thigh is rolled for cooking and sliced thickly. You also get a side salad, soup with tofu and condiments of black soya sauce, ground ginger and piquant chilli sauce. Thinking of western food? 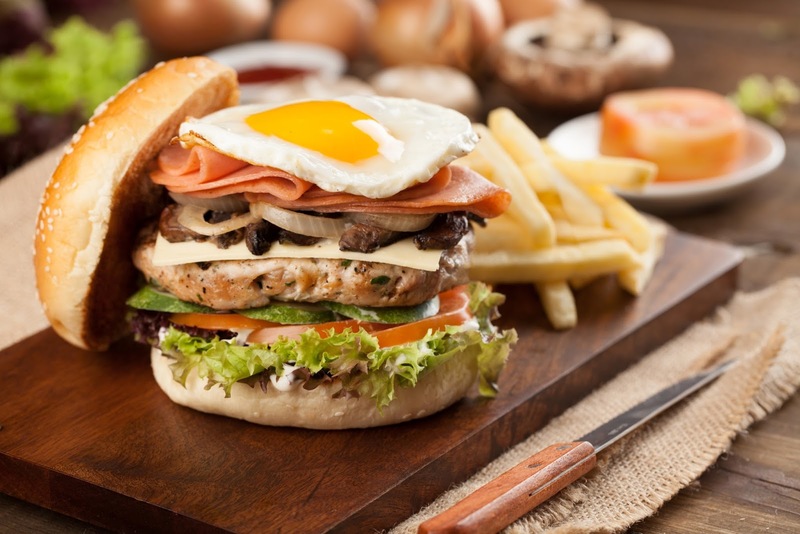 Try the beef/chicken burger in a house-made bun, with melted cheese, beef bacon, lettuce and sunny side egg. Served with french fries, a bowl of salad and tomato/chilli sauce. For My Chicken Chop, a whole chicken thigh is crumbed and deepfried. Crispy on the outside and moist inside. Comes with a choice of mushroom or black pepper sauce. Then there is dessert. If you’re there during the lunch and dinner buffet hours, you get to pick from the variety of cakes and fresh fruit on the buffet spread. Otherwise, you get a dessert of the day. The Coffee House also has a new regular a la carte menu with items such as Curry Fish Head at RM39.90 nett. It’s enough for two to share and comes with 2 bowls of white rice.